And I guess 15 Minute Spicy Shrimp with Pesto Noodles Day, too! Today I’m doing the unthinkable and cutting myself off from my usual habit of writing every word known to man in one single post. I KNOW. I literally woke up this morning and wrote, like, 8 paragraphs of my usual blabber, like I normally do. But then I read it, and to be honest, it just felt weird and not right to talk about regular life stuff in light of the seriousness of this holiday. So I deleted it. And we’re going short and sweet instead, hopefully to encourage us to spend some time today both honoring the people who have served our country, and making some Spicy Shrimp with Pesto Noodles for the ones we love. Okay. So this meal comes together in a snap and the flavor is rockin. The shrimp cook so fast – something I always love about shrimp! – and those spicy little guys are piled high atop a bed of raw zucchini noodles that are coated with the BEST ever pesto that’s not actually pesto (it’s all plant-based and it’s SO addicting). I know it sounds weird with the raw zucchini thing, but please. You must try before judging the zoodles fad. I LOVE IT, other than the name zoodles. Bleh. Plus this recipe will give you more of that healthy green pesto than what you need for the zucchini noodles, which you will thank me for later, because it goes with anything and everything much like our favorite Magic Green Sauce. It’s light, flavorful, colorful, nutritious, and full of flavor. If you need a spiralizer, I highly recommend the Paderno ! <– this is an affiliate link. Hand slicing the noodles works just fine, too, but that Paderno makes it so easy. Wows! 15 Minute Spicy Shrimp with Pesto Noodles – a light, healthy, quick and easy meal with zucchini noodles! Light, flavorful, nutritious, and full of flavor. For the pesto, pulse all the ingredients in a food processor or blender until mostly smooth (or until you reach desired consistency). This will make about 2 cups of pesto. 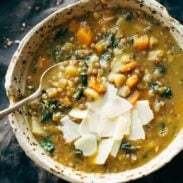 Set aside one cup for this recipe and save the other cup for something else later (you can freeze it, but we just keep it on hand in the fridge because it goes really well on just about anything). Heat the butter or oil over medium high heat. Add the shrimp and toss with the spices – I usually just do this right in the pan to save myself a dish, and I don’t really measure the spices – I just eyeball it until they get pretty well coated with spices. Sauté the shrimp until they evenly coated with spice and fully cooked (they will no longer be translucent). Cut the zucchini into long noodle-like shapes – the best way to do this is with a spiralizer but you can also use a peeler. 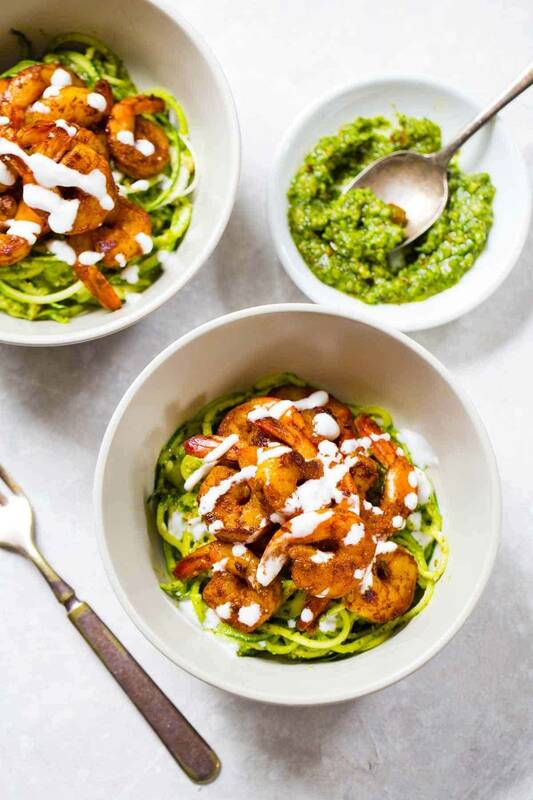 Toss the zucchini noodles with the reserved pesto and top with the shrimp. The zucchini noodles will seep out water as they sit coated in the pesto, so I recommend tossing the noodles right before serving. If you have leftovers, just store everything separately and assemble before serving. I prefer to serve the noodles raw rather than sautéed – I like the soft-crunchy texture. But if you don’t like that idea, just toss them in a pan and saute them with some oil, garlic, salt, pepper, etc. for a few minutes. 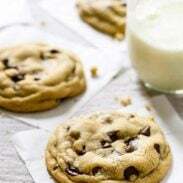 Quick and easy = the best! This looks so yummy and so easy!! I love everything about this! Pinned! This looks wonderful! I’m wondering what the white- ( sauce?) is that’s on the shrimp; at least that’s what the picture makes it look like on my computer. I look forward to rating this recipe once I’ve made it. Many thanks! Hi, Sharon! Lindsay drizzled crema (mexican sour cream) over the top of the shrimp for serving. This was delicciouuusss!! I love pesto but never thought of eating it this way! It all worked so well together! Amazing! Ahhh this looks delicious too. I’m a big fan of pesto – my sister makes it with fresh herbs from the garden and it’s so incredible. Adding shrimp sounds like an amazing idea. Fresh pesto from the garden?? YUM! Enjoy, Melissa! This was seriously SO GOOD!!!!! It’s def a keeper!! We love to hear that, Mariana! Thanks for the comment! Hi Lindsay! I love this new healthy spin of pesto you’ve got there! Sounds like my kind of food- fad, delicious, fusion-y yet healthy! Thanks for sharing! Glad to hear that, Kim! Hope you enjoy it! Should the almonds be the raw ones? Or can you use the roasted ones? Perfect for Summer! Only a crazy person wouldn’t love it! My husband and I absolutely loved this recipe and are very happy with the leftover pesto… so many ideas!!! I will definitely be making this again and I cannot wait for leftovers tomorrow. Huh.. I wonder why your numbers came out so differently? Anyways – nutrition facts aside, everyone needs a good stash of splurge recipes, too. 😉 Glad you enjoyed it! also got way different numbers. My calculations came out to 522 calories, 42.3 g of fat and 18.7 carbs. Can you share how you calculated yours please? thanks! This recipe! Little effort, high reward. That’s how I like it. AND my man also loved it, like really really loved it. Thanks for doing what you do! Glad you enjoyed it, Lesly! This is my first zoodle dish! I chose this one because the pictures made it look sooo good! I’m actually in the process of making it. All I’ve got done so far is the pesto, and oh my goodness! It is amazing!! Pretty sure my husband who hates spinach and kale will love it too! What a great way to get in some nutrients!! Can’t wait to taste the dish once it’s done! Thank you! Hope you enjoyed it, Melissa! I use a handheld zoodler for my zucchini and I’ve noticed that my noodles get very watery after sauteing and my dishes are almost soup-like. I see that you like them raw, but do you have a specific process that you do to avoid a watery dish when you saute your zucchini? Thanks, this dish looks incredible and I can’t wait to try it! Not really. I just try to do more of a flash-cook in the pan rather than a full blown saute – so just even one minute in the pan is enough for me. I find that the raw noodles stay a little lighter and less watery/heavy than the ones that have been sautéed for a few minutes. This will be my first attempt at zoodles. Are they meant to be a cold noodle with pesto in this dish? Or do you heat the pesto and then toss with the raw noodles for a second? Made this tonight for my boyfriend who doesn’t like traditional pestos and he LOVED it. Great success! This looks delicious. It’s important to feel what makes you feel good! This looks yummy and healthy. Thanks for sharing! Yaaaas! A pesto without pricey pine nuts! Thank you! Hi! I would love to make this tonight. What is the white sauce on top that you have drizzled as a final touch? Lindsay drizzled crema (mexican sour cream) over the top of the shrimp for serving! In the photos there’s a white drizzle on the shrimp but I don’t see that mentioned in the recipe. Please advise! Oops, never mind. I didn’t read all the comments. Crema. Sounds great! Thank you for the review of the spiralizers. I bought a Paterno for my daughter and myself. She loves it. I had to give mine away! Why? I am left handed! I all but stood on my head and had to have assistance. I simply ran out of hands, lol. So for me the Mueller was the ticket. I thought your readers might want to have that information. What did you drizzle on top? Some sort of white sauce? Trying this out. Thanks!